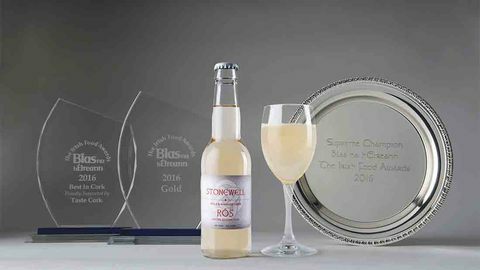 A rhubarb-flavoured pink cider has recently been crowned supreme champion at the Blas na hEireann Irish Food Awards in Kerry. Barbara Collins speaks to the cider makers and one of their apple growers. Irish craft cider is a young industry but sales are booming. Stonewell Cider was one of the first companies to take on the industry giants and is now regarded as one of the leading producers in the country but for husband and wife owners, Geraldine and Daniel Emerso, it has been a steady journey of discovery. Located in Co Cork, they produce the fruity drink using only Irish for their multi-award winning blends including their latest addition, Stonewell Ros. “We only made a small quantity of Stonewell Ros to test the market this spring,” explains Geraldine. So little was the quantity meant winning the recent supreme champion award at Blas na hEireann was very unexpected given it was just their first blend. 60 acre farm of which 40 are apples, producing about four million apples per year. Harvest runs from August through to November. Other streams of income strawberries, raspberries, plums, cherries, camping and caravan ark, juice and artisan soft drinks manufacture, cider vinegar and farm shop. The use of rhubarb into a cider blend may not be the most conventional of pairings but it is one the couple firmly believe sets them apart from the growing market. “The combination of rhubarb and apples really appealed to us because it was something different to the elderflower and strawberry blends that have now become so popular,” echoes Daniel. When they were offered a few acres of rhubarb by nearby farmer, Robbie Fitzsimmons, they jumped at the chance and began experimenting. "We were thinking of doing something with rhubarb but it is difficult to establish, so Robbie’s offer seemed like the perfect opportunity at the perfect time." For cider production, the rhubarb needs to be frozen and mulched before pressing to extract the juice to achieve a better yield of juice from the fruit. Fermentation of the rhubarb wine is two months instead of the usual two - four weeks because of the high level of oxalic acid in rhubarb, which inhibits the sugar fermentation by the yeast. The rhubarb cider brings to five the number of blends Stonewell do. It all started five years ago in 2010 when the couple began making cider at their home in Kinsale, Co. Cork. The impetus came from the recession which had started to bite. Daniel had worked in media communications and found himself having to commute to the UK for work, while Geraldine worked at home as a bookbinder looking after young children now aged Aliénor, 14, Séraphina, 12 and Colm, six. Tired of being apart and working separately, they wanted to try something different that would allow them all to be together. And it seemed their Continental roots were to become their inspiration. Hailing from a family of winemakers, Geraldine is French while Daniel is half-Irish, half Swiss. Daniel remembers making cider and apple juice as a child after he and his father collected apples from their small orchard and used a tiny press. “I never thought I would end up making cider commercially” he says. “It wasn’t until my father-in-law bought me a bigger press that I began to think about it. Geraldine admits she ‘hadn’t a clue’ about making cider so Daniel did some research on the Irish market and they completed a course in cider-making. But, he didn’t give up his job in the media sphere. 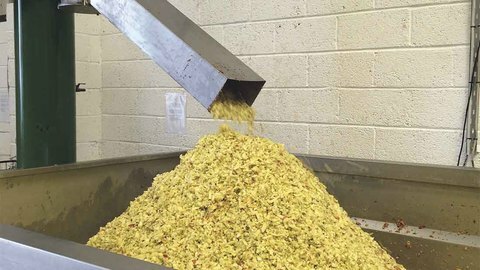 They started off in 2010 and made 3,000 litres of cider using a blend of Elstar, Falstaff, Jonagored, Dabinett and Michelin Apple varieties sourced from local farmers. “It depends upon variety but in any one year we would work with three to six farmers. Certain farmers would provide us with dessert apples and others with bittersweet. The farmers are required to be Dept. of Agriculture approved and need to commit to providing fruit in good condition with an understanding of what it is to be used for,” says Daniel. Geraldine labelled and sold the first batch herself with a baby in tow while Daniel worked in the UK. Bottling was done by one of their apple growers, Con Traas. Three years later they were selling enough for Daniel to leave working in the UK to concentrate on growing the cider business. Requiring greater electrical power to drive the presses and mills they were using, they moved production out of their home into a larger commercial premises in Carrigaline, Co Cork, investing in tanks, presses and filters and easier haulage access. As scale has increased so have staff numbers and the couple are joined by three other staff members to help with production, marketing and administration. And while the production side has been booming so inevitably has the harvest, which last year enabled them to produce 450,000 litres of cider from the 650 tonnes of fruit their farmers supplied them with. So how have they managed to grow the business from 3,000 litres output in 2010 to their current yields of 450,000 litres achieved last year? Geraldine believes one of the reasons is their persistence with creating quality and continuing to use only fresh apple juice. “We want to keep that point of difference and stick to our high production values,” says Daniel, who is also keen to highlight the importance of their distribution partnership is vital. Also key to the growth of the business is the use of new media and presence at trade shows and festivals. “We do regular blog posts and put up short videos on the farmers we deal with and how you make cider. All of that communication both online and in person make a real difference,” says Daniel. Looking to the future the couple are looking to expand in the export market having signed a major distribution deal earlier this year with Carlsberg France and also export to Holland, Germany, Switzerland, the UK, Spain, Australia and Canada. "The most interesting export markets are those ironically that have little or no cider heritage and it is they that are growing the most strongly,” says Geraldine. One of the farmers who supplies Stonewell is Con Traas from The Apple Farm. Based in Cahir, Tipperary, an area known as The Golden Vale, he is the Chairman of the Irish Apple Growers Association and the Irish Farmers’ Association Apple Committee. “We have grown apples since 1968 when my parents came from Holland to Ireland with the intention of becoming apple growers,” says Con. He became involved with Stonewell when they were was starting up. For the first few years, before they upscaled, the couple needed apple pressing and cider bottling done on contract, and Con had that type of equipment due to being in the business already. “Stonewell like some specific varieties of apples, for example, in my case, Elstar, to make a specific type of cider. “The trees themselves are not fussy on soils, as long as they are not waterlogged but the challenges to farming orchards are too numerous to mention specifically. 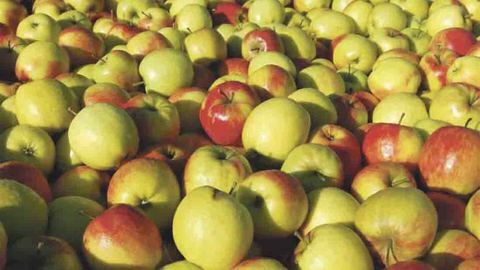 “Growing apples is probably the most complex type of growing that can be done due to the multi-annual knock-on effects of decisions made years in advance. “It is the reason most people who decide to become apple growers in Ireland don’t persist beyond when their initial investment is lost. “The trees need nutrients like all plants and are given using soil and/or foliar applications to replace what is taken off by crop removal. “Because of the nature of the plant, which feeds itself by drawing back nutrients from foliage in the autumn, and due to the exceptional amount of carbon which gets sequestered into the soil due to leaf fall, nutrient additions are much less than would be typical for arable crops which might yield similarly. 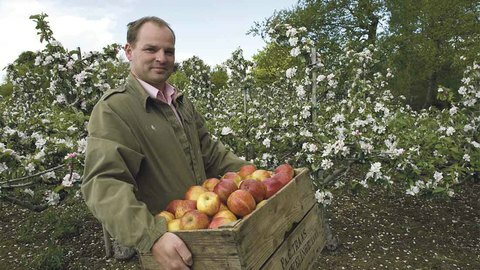 “Bear in mind that a good crop of apples could be 70 tonnes per hectare” explains Con. Irrigation is not used in Ireland. In terms of pesticides they use IPM and IFP systems. These are decision support systems based on complex computer models of what happens in the orchard on an hourly and forecast basis, so fungicides may be used. “Mating disruption systems are more likely to be used than insecticides. Huge populations of beneficial insects, spiders and mites are encouraged in the orchard, which is not like a normal sprayed crop, but more a much more complex orchard ecosystem supporting a wide range of life, but managed in a way that the damaging pests do not surpass certain injury thresholds. Stonewell are just one of our customers. They take less than 1 per cent of our total output so it means that they collect when it suits them. Con, a cidermaker himself, markets his brand under his Con’s Cider label and produces a variety of juices and cider vinegars.